Native Desert Rat. That’s how someone would’ve described me years ago. “You were born here?” The term might still be in use, but I haven’t heard it lately. Although born in Phoenix, in southern Arizona, I never really felt “at home” in the desert. After marriage, we lived all over the place from Germany to California, and I enjoyed the greener areas. But now, back in Arizona, I’ve discovered the central desert…and I love it. Driving around this state, you can encounter barren desert like the Phoenix area, heavily foliaged areas with a wide variety of cacti and other desert plants, snow-topped mountains, awesome red rock landscape, green valleys, pine forests, and more. For several years, we lived on the golden plains just north of Prescott, Arizona. 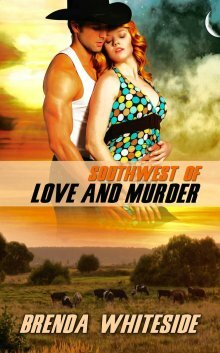 I set book two in my Love and Murder Series, Southwest of Love and Murder, in Chino Valley. There are grassy flatlands and rocky hills with plenty of wide blue skies. It’s where the antelope roam and ranches exist. Phoebe, the heroine, leaves the city for a little R and R on the Meadowlark Ranch on the Chino Valley plains. Rancher Mason Meadowlark is more than happy to be the recreation part. But murder follows her. Speaking of murder, it’s beautiful country, but not much water. My husband would’ve killed for a lake. Since he’s an avid fisherman, we migrated eastward a couple of years ago. Now, we live in the basin, only minutes from Roosevelt and Apache Lakes. It’s still the Sonoran Desert, the only desert where the Saguaro Cacti exist, but other native plants and trees are abundant. Springtime can be awe inspiring when everything blooms yellow, purple, orange, and hot pink. Phoenix always seems to be the travelers’ destination when coming to Arizona for the first time. I’d advise you to head north on I17 out of the Valley of the Sun as Phoenix is called, take the Prescott exit, and explore. Then go east to Jerome, a ghost town in the Black Hills, then over to the red rocks of Sedona. After that go north to Flagstaff and the San Francisco Peaks. Don’t miss the Grand Canyon. As you head back south, come to Tonto Basin and the Roosevelt Dam. If you’re real brave, take the Apache Trail to Apache Lake. If you’re daring enough, you can drive the Apache Trail back to the valley and Phoenix. These suggestions will show you Arizona has much more to offer than sunbaked, barren landscape and a sprawling, big city. Mystery writer Phoebe Anderson owes her success to killing her first husband on paper seventeen years earlier. Now someone has actually done it. When she decides to take a few days away on the ranch of her best friend’s brother-in-law, she doesn’t expect romance to find her...or murder to follow her.